Not only was this year's IFA show a strong one for wearable tech, we also saw a ton of new smart home tech. Mike and Hugh have already broken down some of the stuff around Alexa and Google Assistant getting in absolutely every smart home gadget going. Leading the way was Sony's new $200 LF-S50G smart home speaker, powered by Google Assistant, as well as new AI assistant speakers from Mobvoi, Panasonic and more. Here, though, we thought we'd get into everything else on show at this year's Berlin expo - fresh, new kit; connected self devices that are close to going on sale and new features for our fave products. Enjoy. We've loved these damn fine modular Aurora smart light panels for a while now, so much so that they adorn multiple editors' walls. 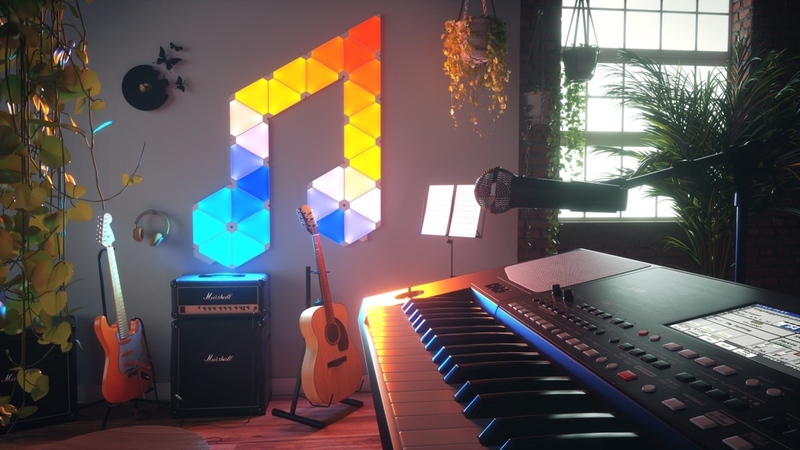 Now Nanoleaf is showing off a new €60 Rhythm module that plugs into the system, tracks the music you're playing and creates a light show to match. AKA The Dream. There's also scenes to pre-program as well as Alexa, Apple HomeKit and Android compatibility. You can buy the whole thing, with nine panels and a Rhythm module, as a €250 starter kit later this autumn. Nanoleaf also brought a pretty bonkers Aurora Remote concept to IFA. The idea is that you turn the wireless dodecahedron, which has an accelerometer and gyroscope inside, to change brightness, settings or switch animation scenes of your Aurora smart lights. And you can customise the motion controls. Much more fun that fiddling about in yet another smart home app amiright? Harman Kardon announced its Cortana powered Invoke smart speaker a few months ago and it used IFA to join the Alexa club. The Allure is a 360-degree speaker with far-field mics and with its semi-transparent design, it looks a bit like a fancy, tiny blender. There's a nice ambient light which reacts to voice commands and music - it will go on sale in winter 2017 for $250. In the Google Assistant corner, the now Samsung owned Harman showed off a range of JBL Link speakers - two portable and one for the home. They all have Google's voice assistant as well as multi-room audio, Chromecast support and there's actually a nice range of prices, for once, if you want to build up a smart, wireless system: €170, €200 and €300. First debuting at this year's CES, the smart beauty mirror HiMirror Plus+ was back at IFA. The lights can simulate different situations - party, sunny day, brightly lit office etc - but the 17-inch mirror's real trick is to analyse your skin for wrinkles, dark circles, spots, pores and records your progress as you try out new skin creams and ointments to see if they're actually working. It's not cheap though with pre-orders for $229, rising to $269. With the Amazon Echo Look and its Style Check feature for budding stylists, expect to see more in this quantified selfie trend. The question is - can you handle your face? Bear with us - using 37% less energy to heat your home, according to Netatmo, might not be super exciting but we like the sleek, simple execution of these smart radiator valves. Designed by French design studio Starck, they work with Apple HomeKit and Google Assistant with Alexa support coming in future, a Netatmo rep tells us. The valves can set a heating schedule for a room, detect when a window is open and regulate the temperature according to weather and insulation. They're available now in the UK for £69.99 each. If, like me, you congratulate yourself on keeping a fake cactus intact for a few months, Click and Grow might be the smart indoor gardening hub for you. The Smart Garden 9, which is up for pre-order for $199 now with shipping in November, can grow up to well, nine plants e.g. the default capsules in the pack are three mini tomato, three basil and three lettuce. The best bit is that the combo of smart soil and Click and Grow's smart sensors mean this thing is self-growing. Water, oxygen and nutrients are all taken care of. Slightly less ambitious? Go for the Smart Herb Garden or Smart Garden 3. We got a quick look at this little guy too. On the Motorola and Hubble Connected stand, we saw Hugo. It's an Alexa powered smart home speaker, assistant and 360-degree security camera that acts as a hub for controlling other connected gadgets and appliances as well as hooking up to Spotify for music controls. Hugo is going on sale in 2018. Plus it looks like a mini Marvin the Paranoid Android. Executive editor, and dog lover, James Stables went mad for the Petcube Bites Wi-Fi connected smart camera and treat dispenser. You can check in on your pet from work, 'chat' via two way video and launch treats into the room with a swipe in the iOS or Android app. You can set the distance, portion sizes and set up an automated schedule - though for $229.99, we imagine most pet owners will want the interaction too.